The Lloyd Center for the Environment just received notification from Monarch Watch that one of the Monarch butterflies tagged by students from Westport Elementary School was recovered in the El Rosario reserve in Mexico. The butterfly had traveled 2,290 from Westport to the over-wintering grounds in the mountains of central Mexico! The Lloyd Center has partnered with Monarch Watch, since 1997 to offer the program Mysterious Monarch Migration for elementary and middle school children. The 90 minute program allows students to actively participate in an international research project helping scientists discover how Monarch butterflies navigate their way to Mexico every fall and helping to asses the population status. The program has been supported in Westport through a generous grant from Lees Supermarket. Monarch butterflies weigh less than a dime but travel thousands of miles every fall to the over-wintering grounds in the mountains of central Mexico. Why Mexico? Over-wintering Monarchs need a climate that is cold enough to slow down their metabolism but will not freeze the butterflies. The Oyamel forests in central Mexico provide the right conditions, the daytime temperatures may reach 50 degrees with the nighttime temperatures falling to 32 degrees. Monarchs freeze at approximately 28 degrees. 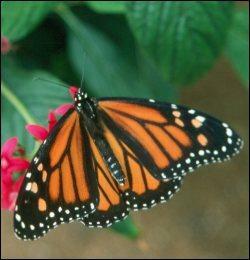 In our area, Monarch butterfly migration takes place from September until mid-October. The migrating butterflies feed on nectar to gain carbohydrates to fuel their daily activities and to help maintain the buildup of fat in their abdomens. In this area, goldenrods are the main source of nectar. The Monarch butterflies that migrate to Mexico in the fall will never make the return trip. They will leave the wintering roosts by the end of February or early March and begin moving northward. Females will lay their eggs on milkweed plants along their route north. These butterflies will die in the southern United States and their offspring will continue the journey northward. Thus no individual monarch returns to their birth place in the northern United States. Also, no butterfly that leaves New England in the fall has ever been to Mexico, they are approximately four generations removed from the Monarchs that migrated the previous year! Yet every year the Monarchs find their way to the same over-wintering areas in Mexico! This is part of the mystery of their migration, one that scientists hope to solve by tagging butterflies in the fall and recovering the tags along the migration route. The tags are placed on the hind wings of the butterflies and do not impede their flight. Each tag has a unique letter/number sequence. The taggers record the id number, location where the butterfly was tagged, whether it was male or female and other information on weather or the health of the butterfly. The data sheets are submitted to Monarch Watch at the University of Kansas. They collate all of the data and notify taggers if one of their butterflies was recovered during its migration or over-wintering in Mexico. According to Tricia Sheppard, Education Director for the Lloyd Center, this is the Center’s third butterfly recovered. “We had one recovered in Palacios, Texas, along the Gulf Coast on its way to Mexico. That butterfly had traveled 1,667 miles in 47 days. The other butterfly was recovered in Port St. Lucie, Florida and had traveled 1,122 miles. Scientists are not sure if the butterfly recovered in Florida was on its way to Mexico or if the Monarchs over-winter somewhere in Florida or the Caribbean.” Sheppard added, “It is very exciting when we receive notification that one of the butterflies we tagged was recovered thousands of miles away. We notify all of the schools that participated in the program so they can find the location on a map. For the students from the school that actually tagged the butterfly it is even more exciting!” The program allows students to learn about the life-cycle and migration of these incredible insects but it also brings in geography. Students can discover a lot about geography, climate, ecology and even math through this program. educational programs offered by the Lloyd Center log onto www.lloydcenter.org or call 508-990-0505 ext. 14. 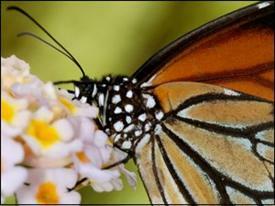 For more information about Monarch Watch, log onto their web-site at www.MonarchWatch.org. The Lloyd Center is located on 55 acres of pristine salt marsh, maritime forest and wetlands at the mouth of the Slocums River in Dartmouth. The nature center is free and open to the public Monday – Friday from 8:30 a.m. – 4:00 p.m. and on Sundays from 11:00 a.m. – 4:00 p.m. The trails are open dawn to dusk 365 days a year. The nature center has a 17-foot pilot whale skeleton; a touch tank with spider crabs, hermit crabs, periwinkles, knobbed whelks, green crabs and other estuarine organisms; a leatherback turtle skeleton; fresh and salt water aquaria and a panoramic view of Buzzards Bay.